There’s no reason to rush to see Tom Uttech’s retrospective at the Milwaukee Art Museum. It opened in July and will be around until early October when the leaves on Wisconsin’s trees ignite our landscape with garish shades of red, orange, and yellow — not unlike those Uttech unleashes in his paintings and prints. If you want a preview, a computer will do. Type in tom uttech and prepare to roam a dense forest of eight pages dedicated to the former UW-Milwaukee professor’s works, available in all sizes and ranges of price. This writer strongly objects to one such listing describing “cheap prints.” It’s no wonder the illusive artist chooses a hideout in the woods to pursue his outstanding painting career. Sure, you can score a small print for $29.95 (a print of a print, if you will), but Uttech is definitely not the Thomas Kinkade of the art world. For those not in the know, Kinkade is an artist of the mall kind, given to salespersons who shine lights on his cheesy stuff in order to make them glow. He’s also one of the world’s richest artists who claims that in the future major museums will beg for a retrospective of his work. Pray the day never arrives. 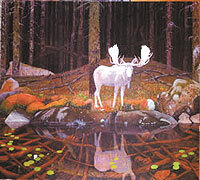 In the 19th century, artists brought forth their notions of the ideal landscape (overblown and bigger-than-life), but Uttech’s vision leaps even further into fantasy with wild touches of painterly magic: for instance, a pink pink red sunset washing the greenest of forests deep wherein dwell the most majestic of beasts. A teller of tales (part real, part not), his amazing images spring from pure inventiveness, not from drawings, photographs, or studies during his many forays into the woods of Wisconsin, Minnesota, and Canada. The result is an astounding camp-out, free of McDonald’s, motels, and neon signs flashing “Vacancy, Vacancy.” It’s a return to a time that probably never was, and in many ways is as much about our diminishing woodlands as it is about the remains of beauty therein. To say his images are postcards from hell is not quite right, but they come mighty close to apocalyptic warnings from nature beaten to shreds by Homo-sapiens. Could you step into one of his paintings, venturing beyond the elaborately carved frames and into the depths of Uttech’s world, you might well want to step out again. Immediately. 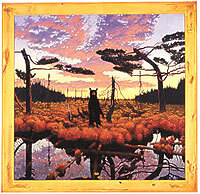 Magnetic North: The Landscapes of Tom Uttech is yours to share in the Baker/Rowland and North Exhibition Galleries. Until October 3. Leave your compass at home and let this master painter guide the way.